Over the years Mopomoso have organised occasional workshops in free improvisation and it has always been our intention to continue and develop this side of our activities. Enquiries are welcome from organisations or individuals interested in working with free improvised music for special events or as part of a longer term curricular activity. 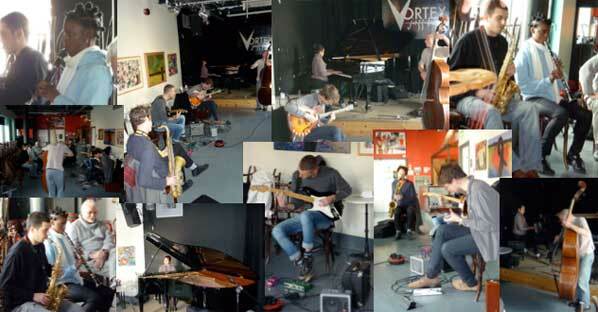 Rachel ran a series of regular monthly workshops for saxophonists at the Vortex. The workshops involved playing in groups of different sizes, exploring different elements that might be utilized when improvising and promoting listening and interacting skills. 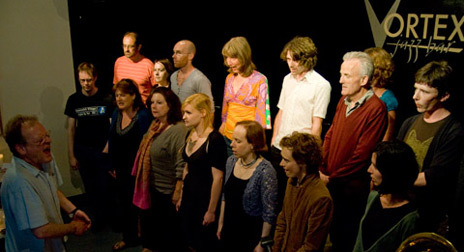 Different prompts were used to spark ideas for improvising, and background examples of other musicians working in this field were listened to. The workshop provided a forum for people to discuss their experiences of playing in this way, and created a friendly and welcoming atmosphere. This took place on November 16th at The Vortex with the first part led by John Russell and the second by Richard Barrett. It was attended by 17 musicians playing a range of instruments and apart from introducing different ways to think about sound and group playing in free improvisation, gave an opportunity for the participants to team up with like minded players. From the initial instruction, ‘Let´s move some air!’ the free piece that followed then led to a break down of some of the elements involved in playing including dynamics and texture, then moved quickly through a general explanation and playing strategies adopted by John Stevens and Günter Christmann with participants playing ‘Search and Reflect’ and ‘Four Short Pieces’. After the break Richard took some of these elements and developed them further, dividing the whole ensemble into sections and showing different ways in which they could respond to each other and also worked with ways in which dynamics can have an effect on group material. About half of the group came to the evenings concert and all expressed an interest in coming again. Here are some of the emails we received after the workshop. “Just a quick note to let you know how valuable I found Sundays workshop. “In my opinion workshops within this music should be taking place all the time around this country, there are so many musicians who have invaluable knowledge and experience and the non-hierarchical, completely democratic approach taken through this process promotes not only artistic communication but realistic social change. “On a personal level, because of this workshop, I met a drummer who was interested in playing some guitar & percussion duo music, something I have wanted to do for a while now. “The workshop at the Vortex was great. I have been looking for opportunities to play Jazz with others for a while and I haven´t found much until now. The style of improvising was also really new and interesting to me. Richard Barrett has led workshops in improvisation in Holland, Belgium, Germany and Australia and is currently Professor of Music at Brunel University where improvised music forms a central aspect of his teaching work. John Russell has given workshops in improvisation for Bedfordshire Education, The Cheltenham Jazz Festival and as offshoots to his own Quaqua projects. He has also taught Jazz guitar at the City Literary Institute and worked in youth and adult education schemes for the London Borough´s of Camden, Harringey, Westminster and Wandsworth. On June the 21st vocalist extraordinaire Phil Minton gave an afternoon workshop for skilled and unskilled singers who then played the opening set in the evening concert. A video from part of this concert can be seen at YouTube.